This is a spell to heal your pet. This spell is not a substitute for adequate medical treatment for your pet and shouldn’t be used as such. This spell is best done on the night of the new moon. Thanks Ammena for sending this awesome spell. Anoint your candles with healing oil. Light the candles and meditate on the healing of the animal. Place a few drops of healing oil in your hands and while raising energy rub your hands together. Do this while meditating on the healing. Concentrate on the energy rising send focus healing energies in your hand. Visualize your hand being surrounded by light. Take your hands and rub the animal down. 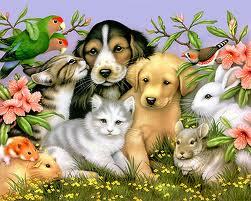 Visualize the healing energies leaving your hand and healing your animal. As you do this see you pet as would if they were in perfect health. See them surrounded by white light that is healing them and protecting them. From illness to perfect health, this (animal) is far from death, Goddess give your healing light, rapid healing with my energies might, this (animal) is blessed by thee, as I will it so mote it be! Let the candles burn until the process is done. Do this every night until your pet is in perfect health again. Thanks to Ammena for sending in this spell. You can leave all comments in the section below. I hope all your pets are healthy and are doing well. As pet friends we have an obligation to make sure they are as healthy as they can be. This spell along with medical treatment will definitely help!